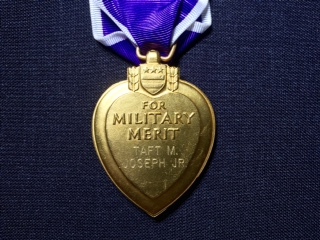 This is about someone very close to my heart whose Purple Heart went missing decades ago—My 80 year old Father, Lt. Colonel Taft M Joseph Jr. (Retired). Who found it, where they found it & most important they wanted to give it back. Award Winning ABC World News Correspondent Clayton Sandell tried to reach my parents multiple times last week but assuming he was a sales person my Dad hung up on him 3 times. He finally reached my Uncle in NC who then told my Father that his missing Purple Heart had been found. Clayton had been doing a piece on Military Stolen Valor & went to a local Army Surplus in his hometown Colorado Springs, Co to see just how easy it is to purchase medals, He saw several Purple Hearts but purchased the one that looked shiny & newer. When he got home & really looked it over saw my Dad’s name engraved on the back. He then knew he must find the the owner or the family. Once Clayton had spoken to my Dad & offered to return the Medal personally you can only imagine the shock & disbelief my parents had! What are the chances of this ever happening??? 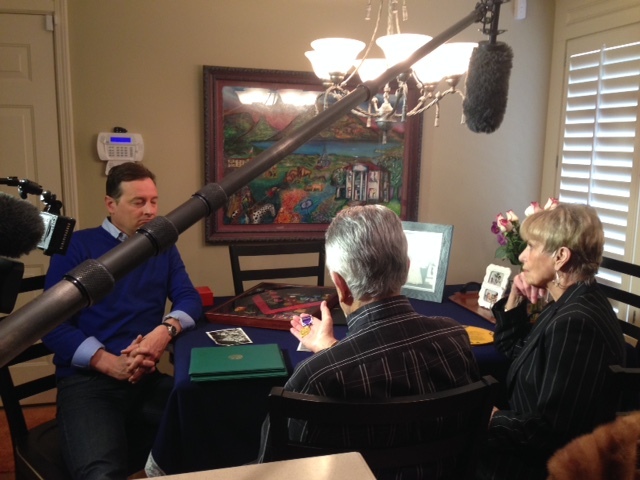 So Sunday, April 12 ABC news film crew, producer and Clayton Sandell all showed up to my parents house to return the Heart & tape the story. Just hearing my mother and father, their voices cracking at times but they held up well. 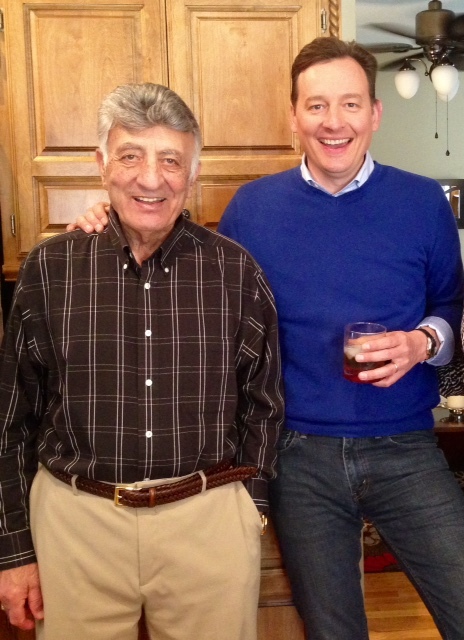 It was very hard for my father to answer some of the questions as he rarely spoke about what had happened but a handful of times with no detail. He was a Field Artillery Captain of a Unit Battalion of about 200 men in Vietnam in 1968. It was during that bloody battle in Plei Djering referred to as the TET Offensive, my Father led his unit into battle & while fearlessly carrying out his orders he was wounded as he did everything to protect & save many men in the line of duty. There was firing on the ground & several large explosions. My Dad suffered a severe bleeding head injury and was hospitalized. That dark day still haunts him. After the news crew left, in a rare moment, he broke down a bit with tears referring to all the men who lost their lives & how guilty he feels for any glory bestowed upon him. He said it’s All the soldiers who are no longer here who are wearing the most weighty Purple Hearts at this Moment. 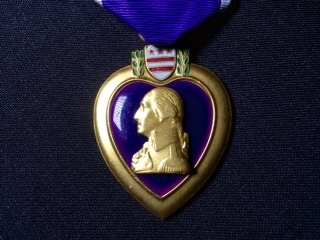 While clearly an individual decoration, the Purple Heart differs from all other decorations in that an individual is not “recommended” for the decoration; rather he or she is entitled to it upon meeting specific criteria. We are very thankful to Clayton Sandell for taking such a deep interest & persisting in contacting my Dad. 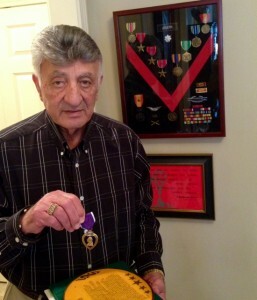 We are so appreciative for him personally returning the missing Purple Heart. We may never know how it ended up in Colorado but all that matters is, it was finally returned after nearly 40 years which is a miracle.